A few days ago I posted the first couple of pages from the third Chapter of Beyond the Ocean's Edge: A Stone Island Sea Story. Here is the last three pages of that chapter. I'm posting them because they might explain why the chapter is titled, "Man Overboard." 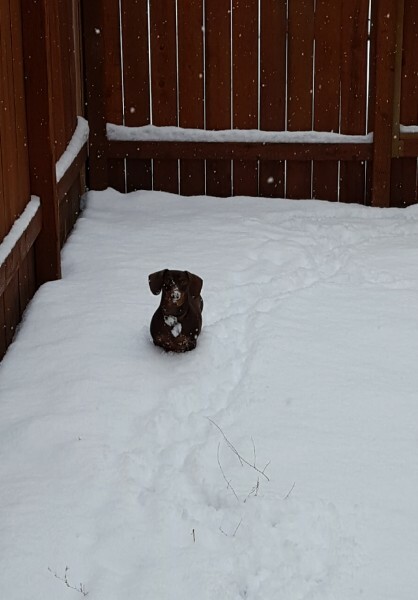 Picture here is totally unrelated, but shows Coco playing in the snow the other day! Theadora plunged through the raw stormy night. On the port tack she ran with triple- reefed topsails, a storm jib, and the barest scrap of a fully reefed spanker. The heel to starboard was moderate and bearable. From time to time white water flashed over the starboard bow and cascaded aft. Soaked to the skin, Pierce checked to see that all tasks were completed. On the huge foreyard, fifty feet over his head, three skilled hands rechecked the gaskets securing the furled forecourse. As they moved inboard, their task completed, a gigantic sea thudded solidly against Theadora’s bows. The frigate staggered from the impact. A shudder passed through the frigate that was magnified aloft. One of the three men on the foreyard slipped, his feet losing traction on the slippery horse. Pierce heard his shriek of terror, and helplessly watched the hapless man fall into the sea, yards from the ship. Instantly Pierce shouted, “Back the main topsail! Man overboard! Man overboard!” He grabbed a line and heaved it to the man in the water. “Grab the line!” Pierce shouted. “Grab that line!” The man struggled to stay afloat, but didn’t hear or comprehend Pierce’s pleas to clap on to the line. Pierce clambered into the port fore channels. As the bows dipped into the sea, he stepped off. “Where? Where is he?” he asked. Men along the side shouted, but Pierce could not distinguish an answer. It was desperate work swimming in the cold water. His clothing, already soaked through from the rain and snow, threatened to drag him under. He struggled on, guided by Mitchell’s calls. He felt the line he had earlier tossed to the luckless individual. He kept hold of it as he swam. He might need to tie it about the man so others could pull him aboard. Very possibly he would not have the strength to keep himself afloat while aiding the seaman to return to the ship. “Hang on, man! I have you!” was all that Pierce could manage. He rested briefly, treading water. “You’ll soon be back aboard. Get this line about you!” Pierce secured the line under the man’s arms and about his chest. Pierce let the hands on the fo’c’sle return them both to Theadora. He concentrated on keeping both his and the seaman’s head above water. Finally they were alongside, and eager hands reached down to haul them from the sea. “Take him first!” Pierce urged. Then other helping hands reached for him and he was on deck. Phelps ordered the main topsail braced around and the ship resumed her course. “Punished for surviving, sir?” Pierce somewhat daringly asked. “We’ve seen that before,” said Pierce. His teeth chattered. “Tell Mr. Phelps I’ll relieve him shortly.” He made for the companionway and went below.